Start stroking your whiskey retailer connections now, because you may want this. Heaven Hill Distillery announced the late fall release of a 27-Year-Old Barrel Proof Small Batch Kentucky Straight Bourbon Whiskey. If you know the story of the Heaven Hill Springs Distillery fire in 1996, you’ve likely done the math to calculate that this whiskey was produced at before that. According to a news release, 41 barrels used in this upcoming bottling were produced in 1989 and 1990. Each bottle of the 3,000-unit release will be priced at $399—not all that extraordinary given the bourbon’s age and the outlandish prices Paid for younger whiskeys on secondary markets. All but five of the barrels in this small batch were aged on the first and second floors of Heaven Hill warehouses. At that height, where the air is cooler, increased humidity saw more evaporation of alcohol than water, causing the whiskey’s proof to drop. When the 41 barrels were mingled for bottling, the natural barrel proof was unusually low 94.7 (47.35% abv). In the glass, the bourbon leads with aromas of dried fruits and baking spices; pipe tobacco notes emerge after a lengthy rest. 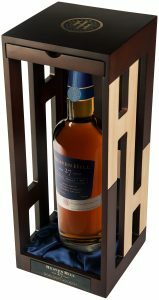 Each 750ml bottle comes in a custom-made wooden box lined with blue satin. The box’s exterior bears a pair of Hs on each side and it’s secured with a magnetic closure. The distiller’s notes label features hand-written bottle numbers, tasting notes and DSP-KY-31, denoting the Old Heaven Hill Springs Distillery. This one-time release is available only in limited markets for a suggested retail price of $399.